Home > News > Thank you for another fundraising milestone! Thank you for another fundraising milestone! In June of 2016, Soulbound Studios crossed an amazing milestone - not only a successful Kickstarter, one of the most funded video game projects of all time. Today, we've made it to another milestone: over $4 million donated in crowdfunding pledges! Without the support of our awesome community, we literally wouldn't be here. The community is helping us achieve our vision of Chronicles of Elyria by keeping us independent through crowdfunding. It's an indescribable experience, and we thank you from the bottom of our hearts for your support. To celebrate, we're going to broadcast a livestream next Wednesday, March 21, at 12 PM PDT / 3 PM EDT / 7 PM UTC where we show off character creation! We want the community to help us test out and play with our latest iteration of our character creation system, so we'll be fielding suggestions from the chat. Let your imagination run wild with us in chat next week! So follow our Twitch channel and tune in next Wednesday to see what the team has been working on! Says the rank 4 account. Posted By **Sarmat** at 08:45 AM - Sun Jan 06 2019 > > Posted By **Sarmat** at 9:25 PM - Mon Jul 02 2018 > > > **you have to spend more money, guys! ** :) > Says the rank 4 account. Here is an idea for a simpler GUI for character creation. Would this be useful? 1: The client chooses random face as a starting point. 2: The client proposes 9 faces that are all similar to chosen face. 3: Let the user select one of the 9 proposed faces. If the user has chosen a face with a longer nose, then the client could perhaps try to guess what the user wants to do and try to propose at least one face with an even longer face next time. Here is an idea for a simpler GUI for character creation. Would this be useful? * 1: The client chooses random face as a starting point. * 2: The client proposes 9 faces that are all similar to chosen face. * 3: Let the user select one of the 9 proposed faces. * 4: Go to 2. If the user has chosen a face with a longer nose, then the client could perhaps try to guess what the user wants to do and try to propose at least one face with an even longer face next time. I was really impressed with the character creation and the style of the tribes. I already liked the Dras from their tribe description, but I thought that they looked way to ghoulish, but the stream showed that Dras can really look good. But the tribe I loved most was the Waerd, which I never expected. And I can't wait for more tribe-themed hairstyles! I was really impressed with the character creation and the style of the tribes. I already liked the Dras from their tribe description, but I thought that they looked way to ghoulish, but the stream showed that Dras can really look good. But the tribe I loved most was the Waerd, which I never expected. And I can't wait for more tribe-themed hairstyles! I had a half day at work yesterday and was able to catch "most" of the stream between taking care of the toddler and infant. Was awesome to watch and see the range of the tribes! Posted By **Oracle** at 02:48 AM - Thu Mar 22 2018 > > Actually managed to catch the livestream this time :) EU here. Curious how many US folk watched the stream in their lunch breaks too :) I had a half day at work yesterday and was able to catch "most" of the stream between taking care of the toddler and infant. Was awesome to watch and see the range of the tribes! We decided on this time and it isn't going to change at this point. Also, we have said all we are going to about the timing of the live stream for now. Just for the record, I love this timeslot. Yes I live in Europe, but I have had to miss almost every Q&A so far, so really excited I can finally watch one! Posted By **Serpentius** at 3/21/2018 4:45:57 PM > > We decided on this time and it isn't going to change at this point. > > Your feedback is noted. > > Also, we have said all we are going to about the timing of the live stream for now. > > Warmest regards <3 Just for the record, I love this timeslot. Yes I live in Europe, but I have had to miss almost every Q&A so far, so really excited I can finally watch one! If I'm traveling through their forest, I'll be terrified of encountering the little weirdos. Going to make certain that none of my trade routes dip into their territory, less I face their squirrely wrath! The Kypiq are freaky! If I'm traveling through their forest, I'll be terrified of encountering the little weirdos. Going to make certain that none of my trade routes dip into their territory, less I face their squirrely wrath! Thanks for the screen capture, Serpentius. Can you guys please address the timeframe concern for the stream? Thanks for the screen capture, Serpentius. Can you guys please address the timeframe concern for the stream? We can't accommodate everyone and every timezone, and we looked at lots of times that we'd be able to do it, and this was the time we selected for many reasons. Hopefully, we'll have a great live stream with many participants, and others can still enjoy the recordings later. Posted By **HolyAvengerOne** at 07:20 AM - Wed Mar 21 2018 > > Thanks for the screen capture, Serpentius. > > Can you guys please address the timeframe concern for the stream? Most welcome. We can't accommodate everyone and every timezone, and we looked at lots of times that we'd be able to do it, and this was the time we selected for many reasons. Hopefully, we'll have a great live stream with many participants, and others can still enjoy the recordings later. We do appreciate the feedback! What kind of reasons? From my POV, this looks literally like the worse timeframe. Working hours for NA-E and NA-W, sleepy time for APAC. There's litterally just part of EU that would be in primetime. Posted By **Serpentius** at 12:28 PM - Wed Mar 21 2018 > > Posted By **HolyAvengerOne** at 07:20 AM - Wed Mar 21 2018 > > > > > Thanks for the screen capture, Serpentius. > > > > Can you guys please address the timeframe concern for the stream? > > Most welcome. > > We can't accommodate everyone and every timezone, and we looked at lots of times that we'd be able to do it, and this was the time we selected for many reasons. > > Hopefully, we'll have a great live stream with many participants, and others can still enjoy the recordings later. > > We do appreciate the feedback! What kind of reasons? From my POV, this looks literally like the worse timeframe. Working hours for NA-E and NA-W, sleepy time for APAC. There's litterally just part of EU that would be in primetime. Can't wait for Q&A and well done on 4 million. Awesome work SBS, can't wait to see the stream. *Makes joke about Hrothi female not having a beard* Awesome work SBS, can't wait to see the stream. I thought it was strange a character creation video was being released but not all the tribe models were revealed yet. My gut feeling was right :') Tomorrow got so much better! Very cool serp. I hope I can make it. I'm just up late tonight at work on an overnighter though it's all quiet now - hopefully get a nap soon. Caspian was nice enough to tease us a few screens of what our live stream will be featuring tomorrow, the Character Creator! To see these and more creations the Soulbound team shows off using this sweet new tool, make sure you watch the live stream tomorrow! 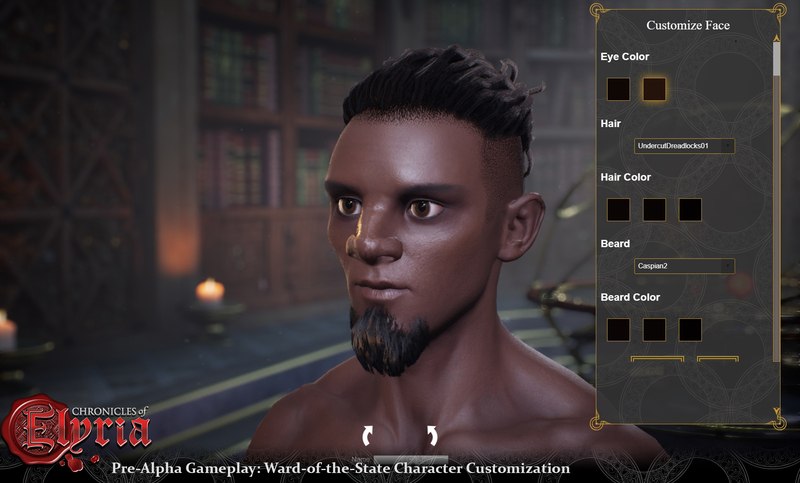 Caspian was nice enough to tease us a few screens of what our live stream will be featuring tomorrow, the Character Creator! Here's a few shots he shared: **Kypiq male** ! 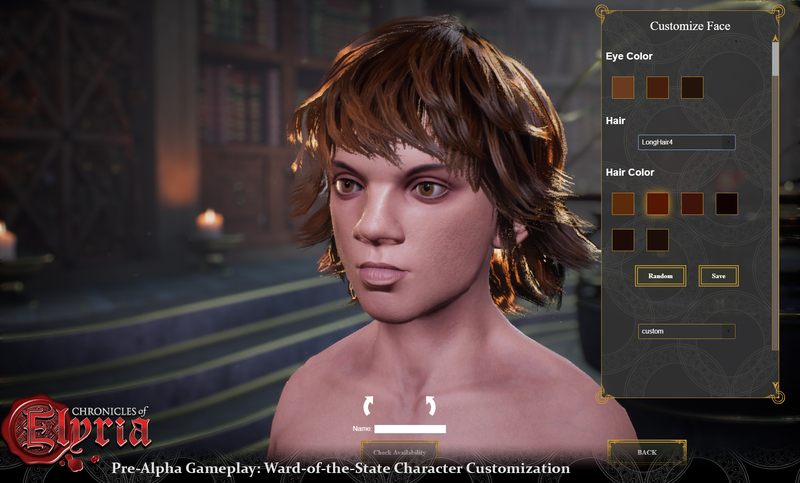 (https://cdn.chroniclesofelyria.com/screenshots/chronicles-of-elyria-pre-alpha-character-creation-teaser01.jpg) **To'resk female** ! 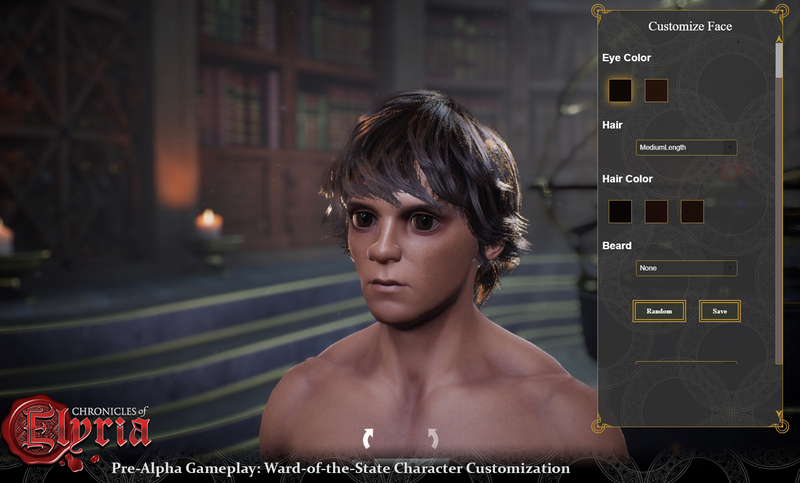 (https://cdn.chroniclesofelyria.com/screenshots/chronicles-of-elyria-pre-alpha-character-creation-teaser02.jpg) **The Waerd male** ! 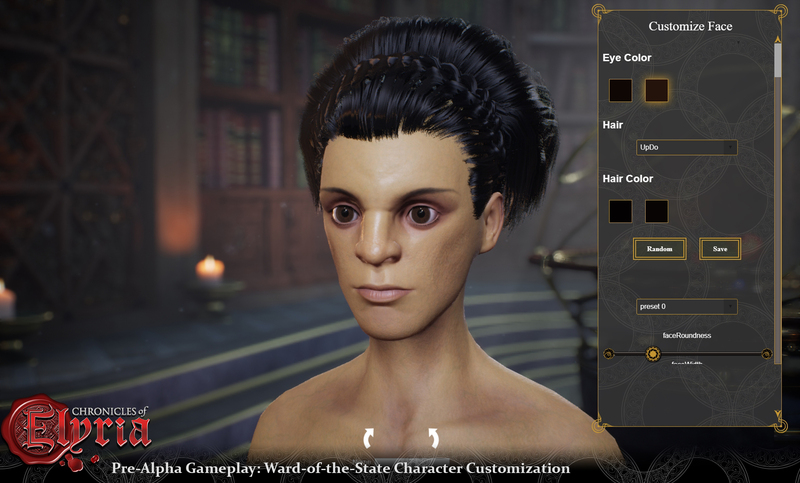 (https://cdn.chroniclesofelyria.com/screenshots/chronicles-of-elyria-pre-alpha-character-creation-teaser03.jpg) **Hrothi female** (last minute add) ! (https://cdn.chroniclesofelyria.com/screenshots/chronicles-of-elyria-pre-alpha-character-creation-teaser04.jpg) To see these and more creations the Soulbound team shows off using this sweet new tool, make sure you watch the live stream tomorrow! See you all there! I don't know, as far as I'm concerned, I find it a weird timeframe. Middle of the week, middle of afternoon for America, yet it will be like 9pm-10pm for most of Europe, so not exactly primetime there either. For an event they touted as a "thank you" and "celebration" for this accomplishment, where they want to build a character with the community... If there's ONE event I would expect to be scheduled in a way that would work for most of the community, it's this one. Posted By **Polite** at 3:48 PM - Sun Mar 18 2018 > > Seems to me they're scheduling it at a time that works for them in the middle of their work day. They are folks that like to kick back and relax when they're not in the office I wager as well :P I don't know, as far as I'm concerned, I find it a weird timeframe. Middle of the week, middle of afternoon for America, yet it will be like 9pm-10pm for most of Europe, so not exactly primetime there either. For an event they touted as a "thank you" and "celebration" for this accomplishment, where they want to build a character with the community... If there's ONE event I would expect to be scheduled in a way that would work for most of the community, it's this one. It's disappointing. Congrats and gg everyone on the $4m mark. That's significant. Great idea about the stream, very appreciated, but why do that in the middle of the day in the middle of the week for such a large proportion of your fan base? Why not do that on a weekend day for instance? At any rate, if you want to do something for the community maybe do it in a way so that thr community can participate. Congrats and gg everyone on the $4m mark. That's significant. Great idea about the stream, very appreciated, but why do that in the middle of the day in the middle of the week for such a large proportion of your fan base? Why not do that on a weekend day for instance? It seems to me that you either think that's a time where most of your players can be available (it isn't, imo), or that you are trying not to get too many to participate... At any rate, if you want to do something for the community maybe do it in a way so that thr community can participate. What an amazing milestone! Congrats to every one at SBS, and I am stoked to watch the stream! Looking forward to seeing character creation. Sounds good, I'll have to set aside some time to catch that stream. It took 73 days to collect another 500 k. So with the same rate of fundrising COE will have aditional 2 ml this year - and it will be 6 ml by the end of the year. 2,5 ml per year is not bad actually, especially taking into consideration that speed of fundcollecting could increase later if they show some real progress and content. Till 2020 this game will have at least 8,5-9 ml of funds from pledges and it's smth already - it could be about half of the sum they need to create the game. It took 73 days to collect another 500 k. So with the same rate of fundrising COE will have aditional 2 ml this year - and it will be 6 ml by the end of the year. 2,5 ml per year is not bad actually, especially taking into consideration that speed of fundcollecting could increase later if they show some real progress and content. Till 2020 this game will have at least 8,5-9 ml of funds from pledges and it's smth already - it could be about half of the sum they need to create the game. Extremely happy forever SBS. Please don't forget what people have done for you. Congrats SBS. Here's to many, many more milestones to come. Congratulations SBS  I think it pays off that you always show you have a clear and approachable plan, allowing people to be confident they will get a great game. By the way, I noticed the resemblance of the word akashic with the Akha people who happen to represent all of humanity, at least on wikipedia that is. I guess this is coincidence though. Congratulations SBS  I think it pays off that you always show you have a clear and approachable plan, allowing people to be confident they will get a great game. However, at this point there is still an – understable – lack of footage. Are you planning on doing some high-gloss teasers anytime soon to attract new backers and funding? The scenes we have seen of the akashic records: eye candy. More please :-) By the way, I noticed the resemblance of the word **akashic** with the [Akha people]( https://en.wikipedia.org/wiki/Akha_people) who happen to represent all of humanity, [at least on wikipedia that is]( https://www.wired.com/story/how-wikipedia-portrayed-humanity-in-a-single-photo/). I guess this is coincidence though. There is always room in the world for more stories and dreams. Bravo on $4M - your team's passion for the dream being woven into digital reality as we watch is obvious, and worthy of all the support given. SBS has given this game soul, it's a delight to see it being made. ***There is always room in the world for more stories and dreams. *** Bravo on $4M - your team's passion for the dream being woven into digital reality as we watch is obvious, and worthy of all the support given. SBS has given this game *soul*, it's a delight to see it being made. Congrats to SBS and CoE! You're making the impossible possible here in front of our very eyes. I'm excited to see what you have to show us! Great news! And also very encouraging to see the progress! The topic of character creation has come up a lot recently so I'm really looking forward to seeing how you as a studio envisioned the process and what options we'll have available to us. Great news! And also very encouraging to see the progress! The topic of character creation has come up a lot recently so I'm really looking forward to seeing how you as a studio envisioned the process and what options we'll have available to us. Hurray, and well done! Here's to $4M more! Great! So hyped for VoxElyria! This is awesome! 4 Million Hype! How do we send you guys Gifts If we have made something to send?